The Master of Business Administration degree has come a long way since its inception in the early 20th century. Since then, there have been several key firsts and breakthroughs, not only in the United States, but around the world. Closer to home, where the Boca Raton Army Air Field once stood, thousands of MBAs have had their own firsts and breakthroughs at Florida Atlantic University, which continues to create history and meet new milestones. Here's a quick look at the history of the MBA and FAU's place in it, from the earliest roots to the present. 1881: The University of Pennsylvania forms the Wharton School of Business, the world's first collegiate business school. 1900: Dartmouth College establishes the Tuck School of Business, which confers the first advanced degree in business. The Master of Science in Commerce — the MBA's predecessor — is created in response to explosive growth in U.S. commerce and industry. 1908: The world's first MBA program is established at Harvard Graduate School of Business Administration with 15 faculty members and 33 regular students and 47 special students enrolled. 1915: Harvard's MBA program graduates its first African-American student, Wendell Thomas Cunningham. The son of former slave Alonzo F. Herndon, he became a pioneering real estate investor and founder of Atlanta Life Financial Group, a company still in existence today. 1948: Canada's top 100 CEOs and company presidents meet at Western University in Ontario and determine the need for a national school of business administration in Canada. As a result, the school creates the first MBA program outside the United States, graduating its inaugural class of MBAs two years later in 1950. 1957: Europe's first MBA program is created in Fontainebleau, France. The Institut EuropÃ©en d'Administration des Affaires (or European Institute for Business Administration), now known only as INSEAD, currently has campuses in France, Singapore and Abu Dhabi. 1964: Florida Atlantic University, which sits on the site of an abandoned airfield, opens its doors and becomes the first public university in Southeast Florida. In a rare university appearance by a sitting U.S. chief executive, President Lyndon Johnson leads the opening ceremony, hailing FAU as a standard bearer in "a new revolution in education." 1964: The University of Chicago's Booth School of Business becomes the first business school to establish a minority relations program. 1968: FAU launches its first MBA program, open to working professionals. 1974: Behind the Iron Curtain, AGH University of Science and Technology in Krakow, Poland, creates an MBA program. 1977: FAU begins offering an Executive MBA. 2000: FAU introduces its MBA in Sport Management as one of its Executive Education programs. The program goes on to become highly regarded and produce more than 120 graduates and assemble faculty with an average of 25 years of experience. 2007: FAU breaks ground on the Office Depot Center for Executive Education in the College of Business thanks to a generous donation from the Delray Beach-based office supply company. 2012: President Barack Obama visits FAU and delivers a major economic address. 2013: Bloomberg Businessweek ranks FAU's Executive MBA program among the best in the nation. That same year, FAU further expands its MBA offerings by reintroducing its Professional MBA after a short hiatus. Enrollment numbers begin to climb. 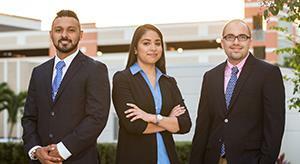 2014: FAU launches Online MBA, Executive MHA and Master of Science in Finance programs. The Online MBA gains national recognition for its academic rigor and ability to push content to mobile devices. "¢ FAU's College of Business is ranked among the top 50 online graduate business programs by U.S. News & World Report. "¢ Under the directorship of Dr. Jim Riordan, a veteran of the Philadelphia Flyers and New York Mets organizations, FAU's MBA in Sport Management program earns a ranking of No. 5 in North America and No. 6 in the world from Sport Business International. "¢ FAU's MBA program is ranked No. 5 in the U.S. for return on investment in a study conducted by SoFi, a San Francisco-based refinancer of student loans. The study analyzed salary-to-debt ratios of MBA graduates and revealed that FAU's have among the best in the nation. "¢ Bloomberg Businessweek ranks FAU's part-time MBA first in Southeast Florida and 27th among all public schools in the nation. What will 2016 bring? Time will tell, but the future looks bright both for FAU's MBA programs as they evolve and grow with the times and its future graduates.